If you want your child to have a fulfilling, rewarding pastime, then enrolling him or her in music lessons is a great first step. Music offers people countless benefits, and you can enroll your child in music lessons knowing that it will be a great investment in your child’s self esteem, academic skills, and more. But signing your child up for lessons is just the first step. Next, you’ll need to support your child on their musical journey. Here are six ways that you can do just that. Music schools aren’t all the same, and the quality of the instruction and programming will vary from school to school. Do your child a favor by putting in some time to evaluate all of the schools that you’re considering so you can find one that matches your child’s needs while offering quality instruction. When evaluating a music school, find out about the specific opportunities that will be available for your child. How are the teachers selected and evaluated, and what types of music do they specialize in? Are there ensembles, recitals, or other performance opportunities for your child at the school? What is the overall approach to instruction? You may find that you encounter music teachers who are great performers, but who aren’t necessarily great teachers. 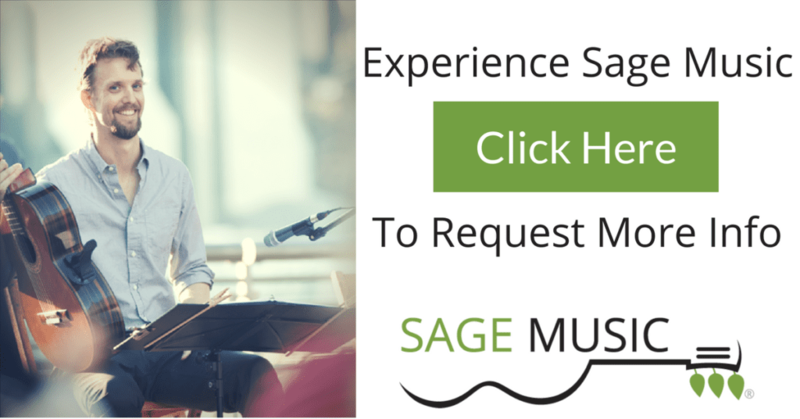 At Sage Music, we guarantee that all of our teachers aren’t just great musicians, but also understand and apply the best methods for teaching private music lessons. We take the time to select teachers who are passionate about teaching, and then we train them to become great educators, too. This ensures a quality education for all Sage Music students. Your child’s practice time is just as important as the time they spend in music lessons. You can help your child to practice by creating an ideal environment at home. Offer your child a practice space that is quiet and free from distractions or interruptions. Maybe you have an office or spare room that will work. If not, you may need to institute some house rules, such as the television must be off and siblings must leave the child alone during practice time. Depending on your child’s age, you may need to get involved in their practice by setting consistent daily practice times. Keeping a practice journal or schedule can help your child to develop good practice habits and discipline. Keep in mind that, when it comes to practicing, quality matters more than quantity. Shorter sessions where your child is focused and working hard are more beneficial than longer sessions where your child isn’t really focused. Because quality practice takes concentration, these quality sessions are usually shorter because your child will need a mental break. Encourage your child to get in the habit of practicing frequently, even if the sessions are shorter. Check in with your child’s teacher about their practice recommendations given your child’s experience level and age. Show your support for your child by attending concerts, recitals, and other performance opportunities or special events. Even if your child doesn’t say it, they’ll appreciate knowing that you’re in the crowd and are there to support them. Plus, these events give you a chance to reflect on all of the progress that your child has made. Your child will benefit from having a quality instrument that is easy for them to hold and play. These aren’t the cheapest instruments on the market, but they’re well worth the investment since they’re usually more durable, easier to tune, and more conducive to young musicians. Before you buy an instrument for your child, check in with their music teacher. Their teacher can recommend particular models and brands to look into, and should help evaluate and approve any instrument before you make a purchase. In trying to encourage and help your child, it’s easy to slip into a place of criticism. Unfortunately, this won’t help your child’s progress, and actually causes performance anxiety in kids, which results in them playing less well. Instead, keep your comments positive and focus on the process of learning, rather than the outcome or the performance. Music should be an activity that your child learns to enjoy, so let their music teacher be the one to provide detailed advice and suggestions. As a parent, you can set your child up for success by being supportive of their music lessons and giving them the tools they need, such as a quality instrument and lessons with a great music teacher. Then, it’s best to be patient. Learning music is a long journey, but it’s one that your child will be able to enjoy for the rest of their lives. I think that investing in a good instrument for your kid is essential. It is the same as getting a great toy for them.